The new laws, which were passed on Thursday through the lower house and set to be looked at by the senate next week, will now see security agencies needing to obtain a warrants to look at journalists’ records, while a lawyer will also have to decide whether extracting a reporter’s metadata is in the public interest. The Australian government says this is necessary for security purposes and to help fight terrorism. If the legislation is passed as expected, it will force phone and internet companies to store records, such as IP and email addresses and telephone numbers for a period of two years. The Media Entertainment and Arts Alliance (MEAA), an Australian trade union, says the legislation compromises press freedom. Organization chief Paul Murphy said even though lawyers will be consulted to oversee if data should be released, they will still be appointed by the government, thus creating a conflict of interest. "This is still a process that's going to be conducted in secret," Murphy added, speaking to the World Today radio program. The ‘public interest advocates’, as the lawyers will be known, will be appointed by the prime minister. Current PM Tony Abbott is in favor of giving security agencies greater power to store and record data. However, bizarrely, Abbott tried to compare the current debate regarding metadata to his own experiences as a journalist three decades ago. "When I was a journalist there were no metadata protections for journalists and if any agency, including the RSPCA [animal protection] or the local council, had wanted my metadata they could've just gone and got it on authorization," he said, adding, “I was perfectly comfortable as a journalist," according to the Australian Broadcasting Corporation (ABC). However, Abbott’s reasoning was slammed by Murphy, who said it was impossible to compare conditions experienced journalists in such different eras. "For Tony Abbott to compare his time as a journalist to now is ludicrous," he told the Australian state broadcaster. "Agencies are now given access to an unprecedented amount of data about our lives and work. The volume and type of data now available was beyond imagining in 1980." @TurnbullMalcolm does my MEAA freelancer card get me the professional journalist protections? The proposed legislation requiring a warrant and providing a public interest advocate to decide if stored metadata is in the public interest will only apply to journalists. Security agencies and the police will not have to jump over such hurdles to access the phone or internet records of an ordinary citizen. 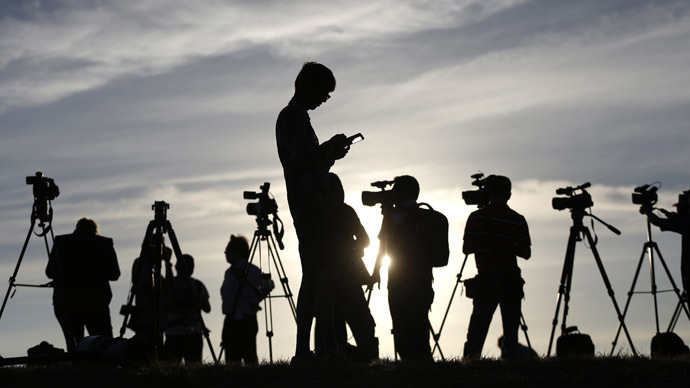 The bill has been supported by the Communications Minister Malcolm Turnbull, who says the new amendments and the introduction of the public interest advocate will offer a “very important protection” for journalists. "There is nothing in the bill, therefore, that should concern journalists about their right to do their job, their duty to do their job and to deal confidentially with their sources," he said, according to the Sydney Morning Herald. "All of us understand that the work that journalists do is just as important in our democracy as the work that we do as legislators," Turnbull added, speaking in the House of Representatives. Although publicly Turnbull is advocating the mass storage of metadata, which can be used by security agencies for mass surveillance, privately, the minister has been using the internet app Wicker in order to send messages. The messaging service, which claims to secure messages with military-grade encryption, allows messages to self-destruct as soon as they’ve been sent, thus making it impossible for any data to be recorded.